Nenas Estate of DiSini festival at Gillman Barracks. It’s 2018, and Instagram is showing no signs of slowing down. 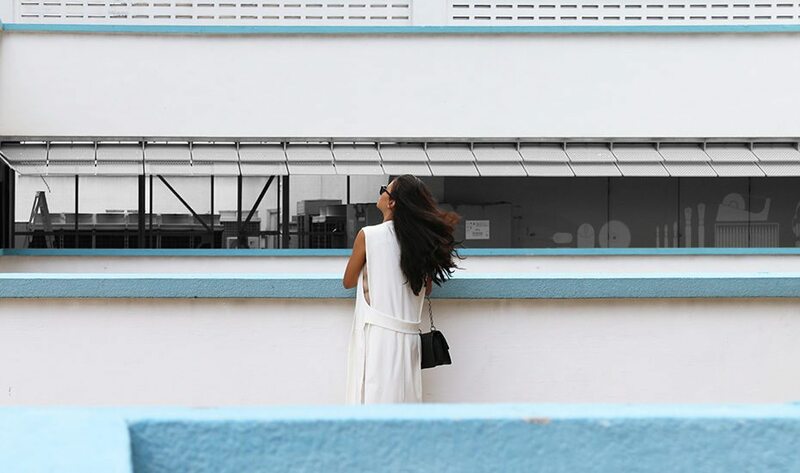 We’re not proud of our addiction to the photo-sharing app, but how else do people share their #OOTDs, travel snaps or mad photography skills, right? 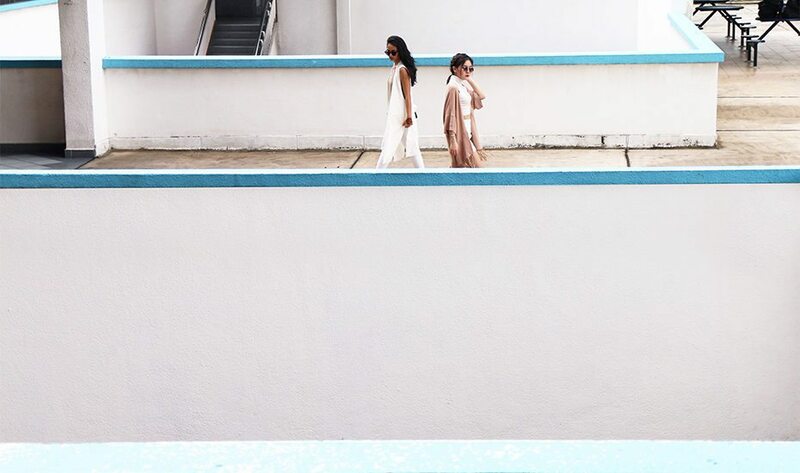 To help you up your ‘gramming game, we combed the island (oh the adventures we had) and nailed down some of the most Insta-worthy spots in Singapore. But hey, we’re not just talking about your run-of-the-mill locales that you’ve seen on everyone’s feeds – we’re here to show you the real Singapore with spots that are off the beaten path, so rest assured that your shots will give your pals some major feed envy. Let’s start exploring! Pro tip: Keep a portable charger handy – you’ll run out of juice in no time. 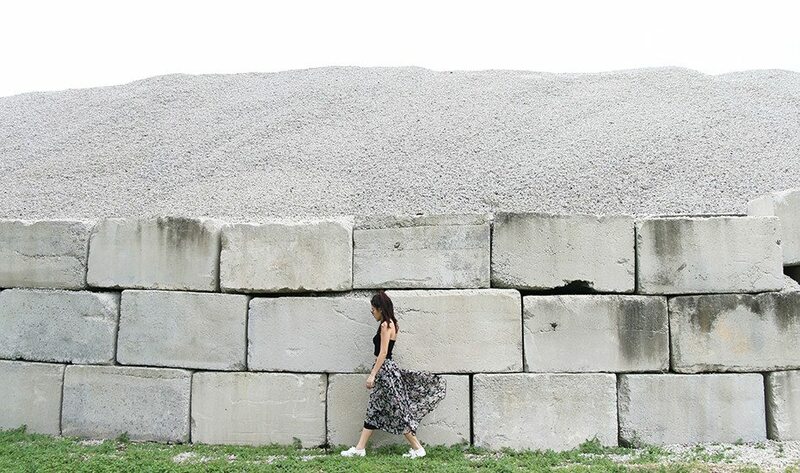 All photography is by Darissa Lee of Honeycombers and Szes Zhang. There’s no better time than now to visit Gillman Barracks – the Disini fest is happening until September 2018. 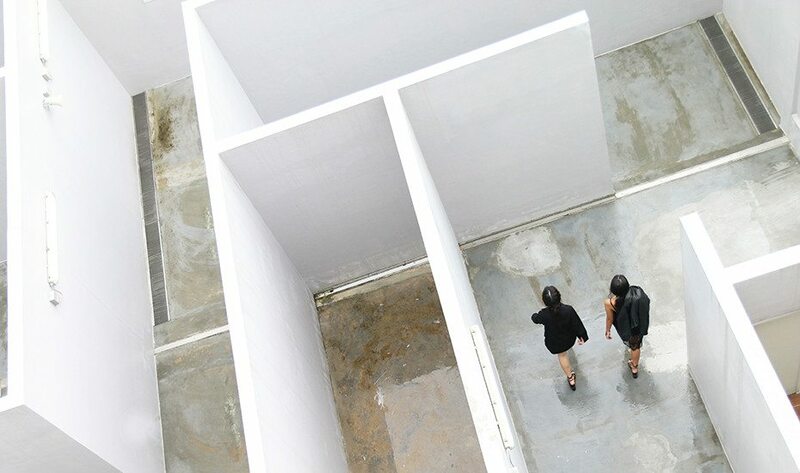 Meaning over here in Malay, Disini curates art installations by visual artists. Seen above is part of Nenas Estate: part of a pineapple-shaped pavilion by local fashion collective Mash-up. 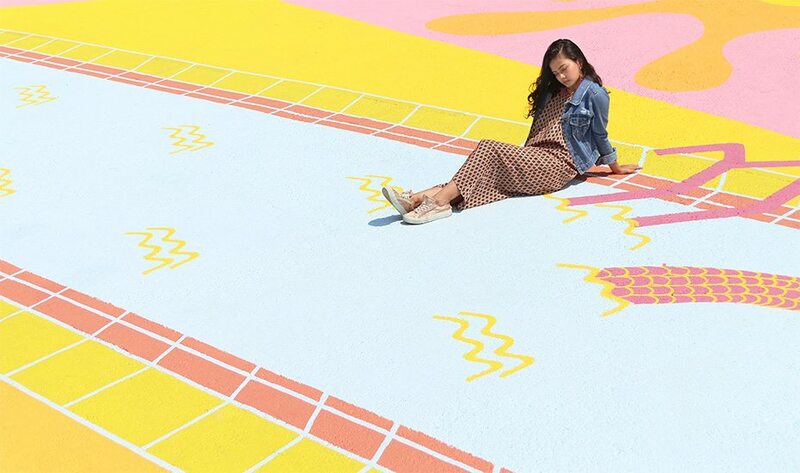 The pastel wonderland is inspired by Singapore’s playgrounds of the ‘70s and ‘80s and features familiar local motifs. Hati and Perasaan by Orkibal. Also of note is Hati and Perasaan by Malaysian artist Orkibal. Despite the bright colours and wonderfully weird illustrations, the striking graffiti mural is his portrayal of his dark days of suffering gout. Block 10 of Gillman Barracks. But festival or not, Gillman Barracks by itself is photo-worthy. 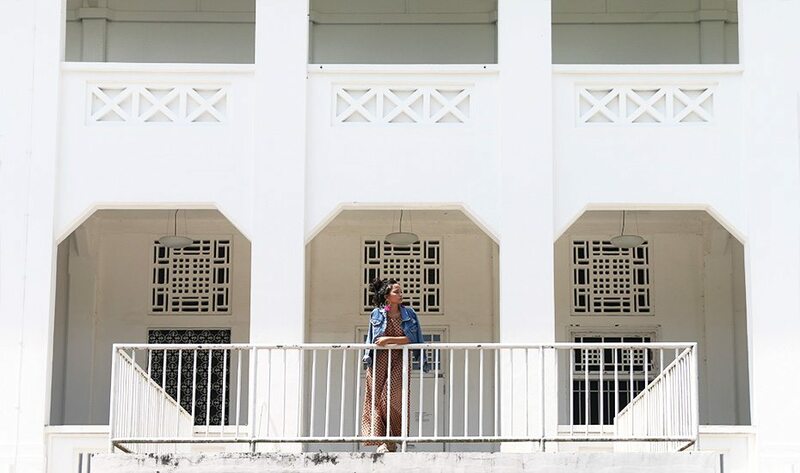 Located amongst lush greenery, the cluster of art galleries boasts conserved colonial architecture, thanks to its past as British military barracks. Getting here: Take the MRT to Labrador Park Station, walk towards Alexandra Road and stay on that lane, heading towards a sheltered walkway. It’ll take you into Gillman Barracks. Nearest MRT: Labrador Park station. The bridge of Double Beauty. 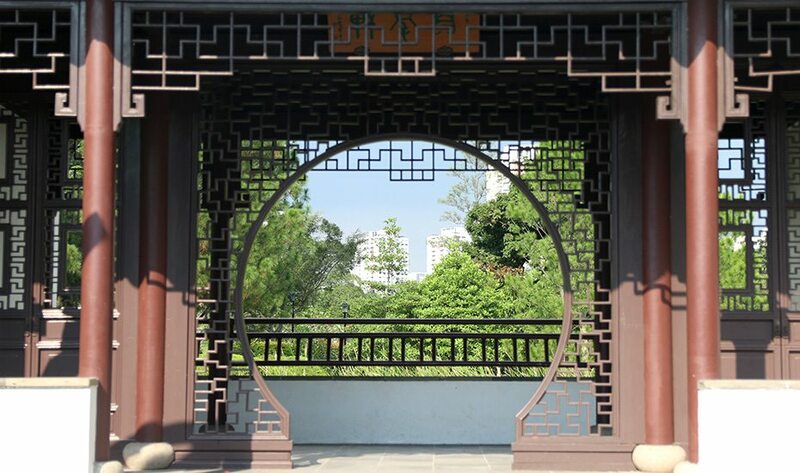 Some might argue that the West has nothing to boast about, but we disagree; it’s home to the Chinese Gardens. 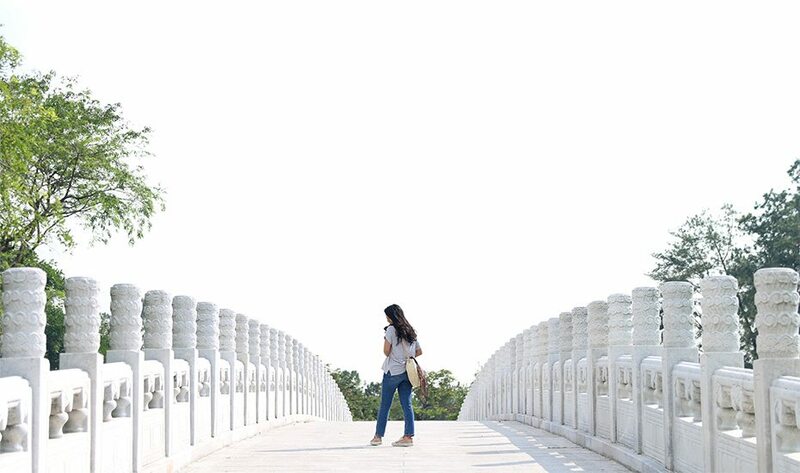 This sprawling park was inspired by the northern Chinese imperial style of architecture. The bridges here are unlike what you’ll find elsewhere in Singapore. Take the bridge of Double Beauty which connects the Chinese and Japanese gardens. Its outstanding white colour perfectly juxtaposes the rich greenery, and red pagodas which dot the park. Venture further and you’ll discover the Suzhou-style Bonsai Gardens. Aside from the gorgeously manicured bonsai trees, the arches and gates in this garden are a real sight to behold. Majestic gates of the Bonsai Garden. The park is currently in the works of transforming into the mega Jurong Lake Gardens. Once completed, the park will see more nature trails, meandering boardwalks, and even water playgrounds. Once done, we’re betting that it’ll be the Gardens by the Bay of the West, so head here now for all the bragging rights. Getting here: Hop on the MRT to Chinese Gardens. The park is just a short 5 minute walk. Getting around it is another story. Rent a bicycle at the entrance or the MRT station. It goes without saying that outfits should be kept neutral for #ootds here. 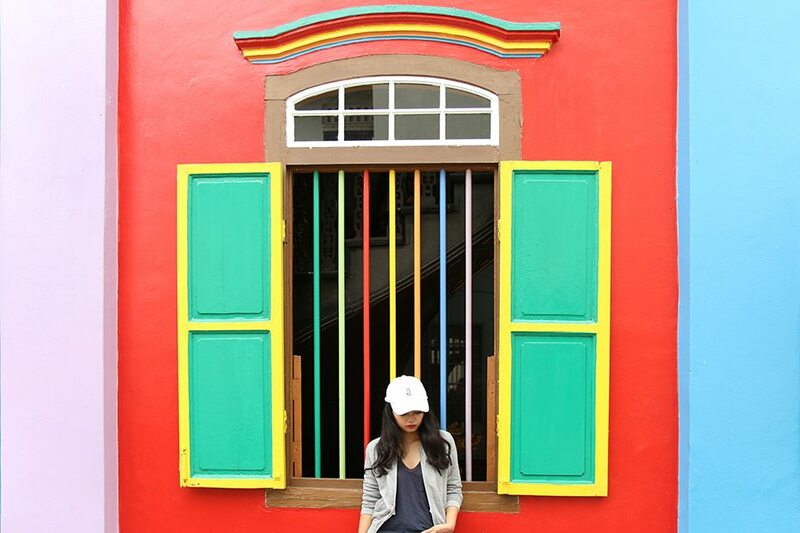 Despite being located in the centre of the Indian community in Singapore, Little India’s most colourful landmark is actually a Chinese villa – and the last remaining one in the vicinity. Its exteriors boast a mix of South Chinese and European architectural details and attention-grabbing psychedelic colours – a refreshing change from Singapore’s gleaming (yet sometimes monotonous) backdrop of soaring skyscrapers and cutting-edge buildings. The House of Tan Teng Niah, 37 Kerbau Road, Singapore 219168. Getting there: Take exit B from Little India MRT. The shophouse is immediately noticeable from an alley on your left. Nearest MRT: Little India MRT. 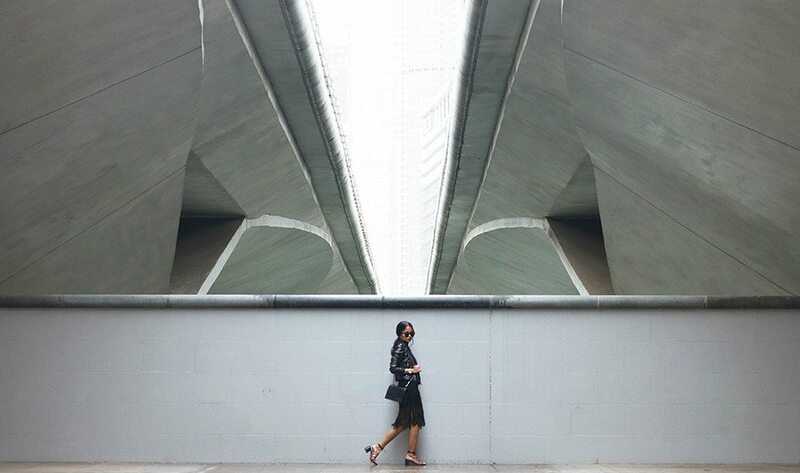 The Esplanade Bridge’s towering structure and symmetrical arches offer the perfect backdrop for a minimalist’s dream #ootd. We’d probably meet with scepticism on this one, but trust us: this one’s a winner. 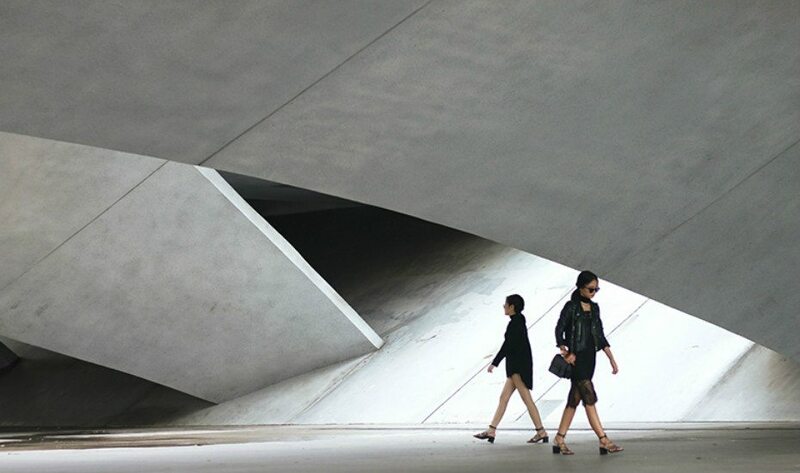 Despite its high density of human traffic and tourists, its commanding structure, shadowed arches and symmetrical planes makes this spot the perfect backdrop for moody #ootds and monochrome architectural shots. Getting there: A three-minute walk from Esplanade. The isolated carpark at Marina Bay Cruise Centre calls for umpteen photo takes. Sit up for this one, city ‘grammers. Serving as a marine gateway to the city, the cruise centre is undoubtedly swanky. Its most striking feature is its roofscape, which resembles the breaking of waves with its angular form and alternating panels of aluminium and glass. To achieve this angle, shoot from the first floor of the carpark. 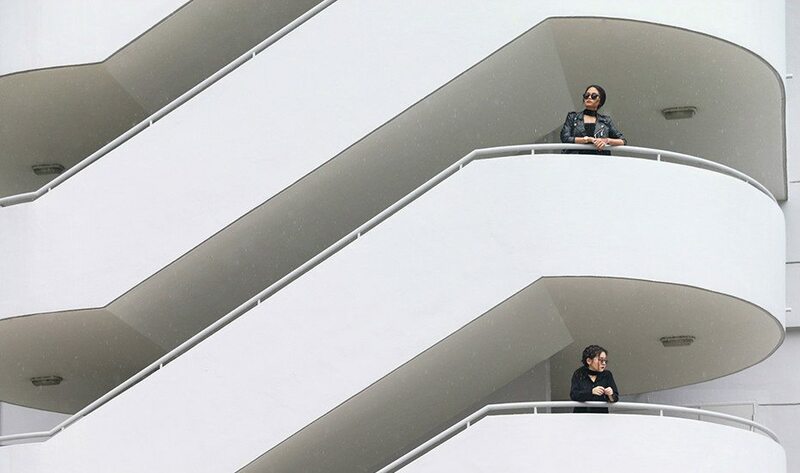 Photo-worthy spots are found everywhere at this architectural icon, including its spacious, sun-drenched carpark (with perfectly symmetrical panels on its ceiling) and sloping entryway. Marina Bay Cruise Centre, 61 Marina Coastal Drive, Singapore 018947. Getting there: Bus service 402, or a not-so-quick walk from Marina South Pier MRT station. Nearest MRT: Marina South Pier MRT station. A combination of lines and curves here leads viewers to the focal point of the photo. Growing up, we were fascinated by Teletubbyland’s hilly green and well-manicured pastures. 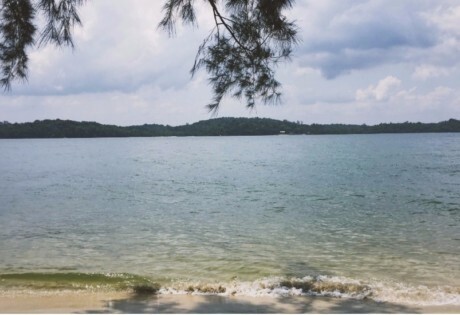 Live out your childhood fantasies at this unnamed grassland located in a residential neighbourhood in Woodlands. With only the sky above and the earth below as a backdrop, all focus will be on your subject. Have your subject hike to the top of the hill – all that negative space helps create a sense of scale, and showcases the brilliant juxtaposition between the enormous hill against the contrastingly tiny size of your subject. Getting there: Walk from Woodlands MRT or take bus 900A from Woodlands temporary bus interchange. 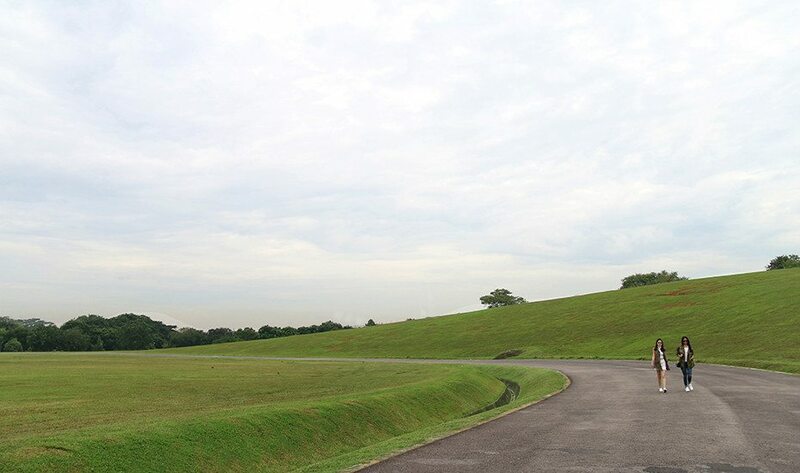 The grassland is located behind the Singapore Sports School and Innova Junior College. Nearest MRT: Woodlands MRT station. Two alternating staircase make up this seemingly innocent one. We’re not referring to the mall itself here but its baffling exterior features. The maze, located on a rooftop adjacent to Mandarin Oriental Marina Bay, can be boggling to figure out if the doors between its paths are locked. Ever wanted to get lost in a maze? The only way to access them is multiple trips up and down staircases connected to these paths. The staircase above is actually made up of two alternating ones (which embarrassingly, took a while for us to figure out). Marina Square, 6 Raffles Boulevard, Singapore 039594. Getting there: For the alternating staircases, look for the Millenia Walk exit. 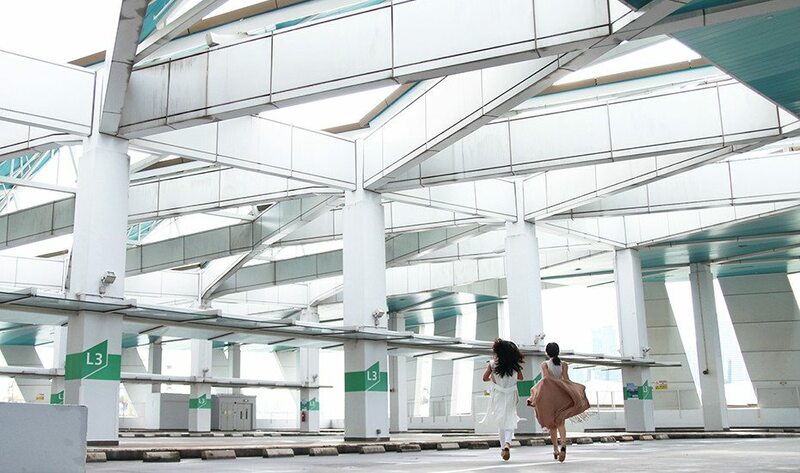 For the maze, walk along the perimeter to Mandarin Oriental Marina Bay, cross the lobby and head up the spiral staircase of the adjacent building. Pristine yachts and floaty, flowered frocks for nautical-inspired photos. It’s not everyday that one encounters a lighthouse in Singapore’s cityscape. Head straight to the pier, where the Johor Straits Lighthouse awaits at the edge, with the Tuas Second Link bridge as another interesting focal point in the backdrop. The lighthouse and bridge in the distance offers a unique landscape for dreamy snaps. Later, walk around the luxe Raffles Marina Country Club and stroll along the promenade, soaking in the sea breeze and gorgeous views. 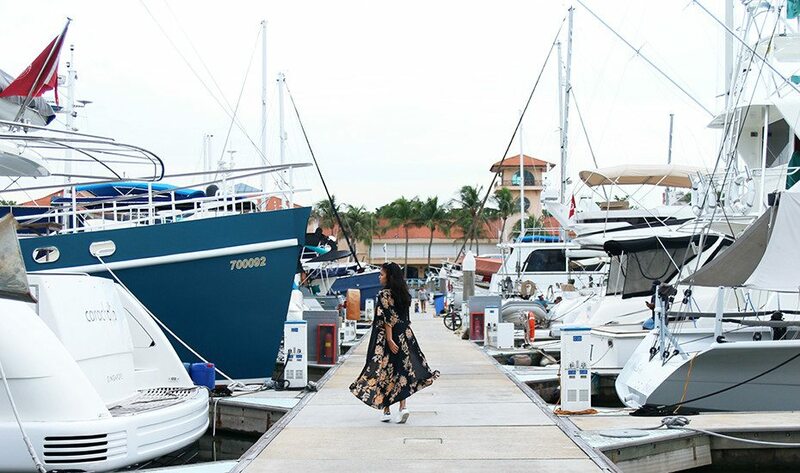 Don’t forget to (pretend to) live the high life with an #ootd amongst the many yachts docked at the marina. Raffles Marina, 10 Tuas West Drive, Singapore 638404. Getting there: Take bus 192 or 193 from Boon Lay MRT. Nearest MRT: Boon Lay MRT. 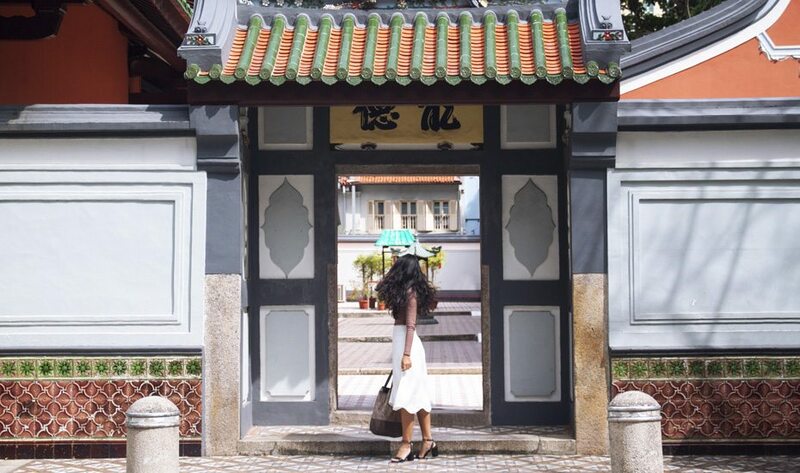 The mishmash of tiles and heritage structure of the temple’s entrance provides a winning combination of an #ootd backdrop. 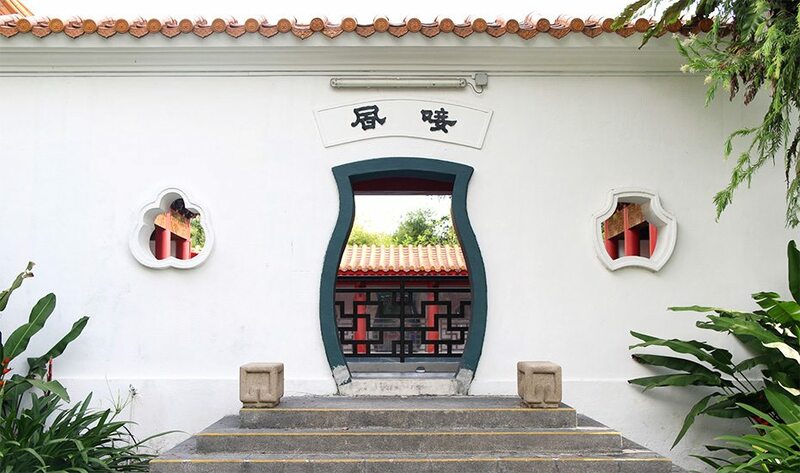 With its remarkable architecture and history (it’s one of the oldest Chinese temples in Singapore), the restored-to-perfection Thian Hock Keng Temple is one of Telok Ayer’s biggest gems. Detailed carvings and sculptures pepper the architectural masterpiece’s interiors, while gorgeous encaustic tiles make for interesting #fromwhereIstand photos. As with any place of worship, proceed with caution and respect. Thian Hock Keng Temple, 158 Telok Ayer Street, Singapore 068613. Getting there: Walk down Telok Ayer Street until you see the majestic temple on your right. Nearest MRT: Telok Ayer MRT. Pops of colour in largely neutral spaces create elements of interest. So, yes this old complex’s roof top isn’t the most hidden of locations and the gorgeous skyline views are by neighbouring buildings. But what caught our eye here are the blue-painted panels, which create striking and perfectly aligned angles amongst the grittier walls. Bras Basah Complex, 231 Bain Street, Singapore 180231. Subtle motions (like this hairflip) creates complexity in photos. Getting there: Walk to Bras Basah complex from Bras Basah, Bugis or City Hall MRT. Take the elevator up to the fourth floor. Huge concrete blocks and grey sand at a construction site in Tuas. We’ll make no bones about this: Unless you’re equipped with a car, Tuas is not an easy place to shoot at. Any serial Instagrammer worth her salt would have heard about the sand dunes and lalang fields. The beauty of Instagram? Casual poses hiding the real context (secret panic at being stranded in Tuas). While these do exist, they require patience to sniff out amongst the confusing terrains of Tuas. Take your time to drive around and recce – abandoned and open construction sites are aplenty here for adventurous ‘grammers. Getting there: While we strongly recommend you to drive there, you have the option of taking 182M towards Tuas South Avenue 9 from Boon Lay MRT. Enormous spaces to create negative space. While entry into the National Stadium is prohibited outside of major events, the public areas in the hub offer multiple IG-worthy spots for the trained eye, including a colourful 888m running track around the stadium, towering staircases and grassy promenade. 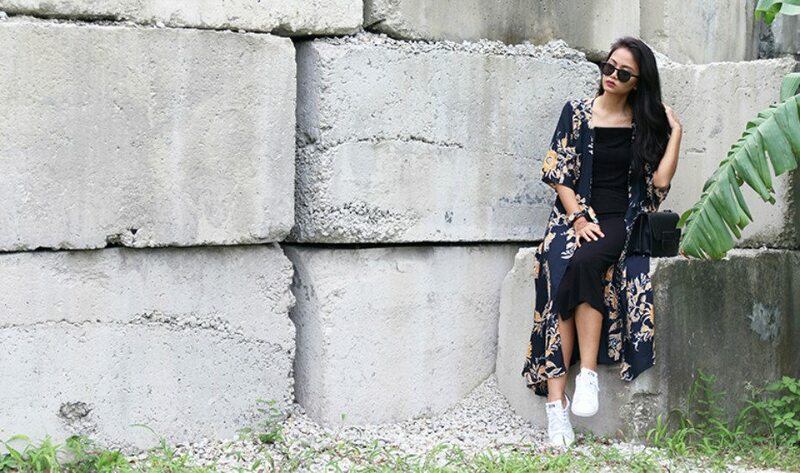 Hit the tracks outside the Sports Hub for an athleisure-inspired photo. Pop by on weekdays or risk being run over by joggers. Just remember to get dressed in your finest athleisure wear first. National Stadium: 1 Stadium Drive, Singapore 397629. Getting there: Take the exit to the National Stadium from Stadium MRT station.